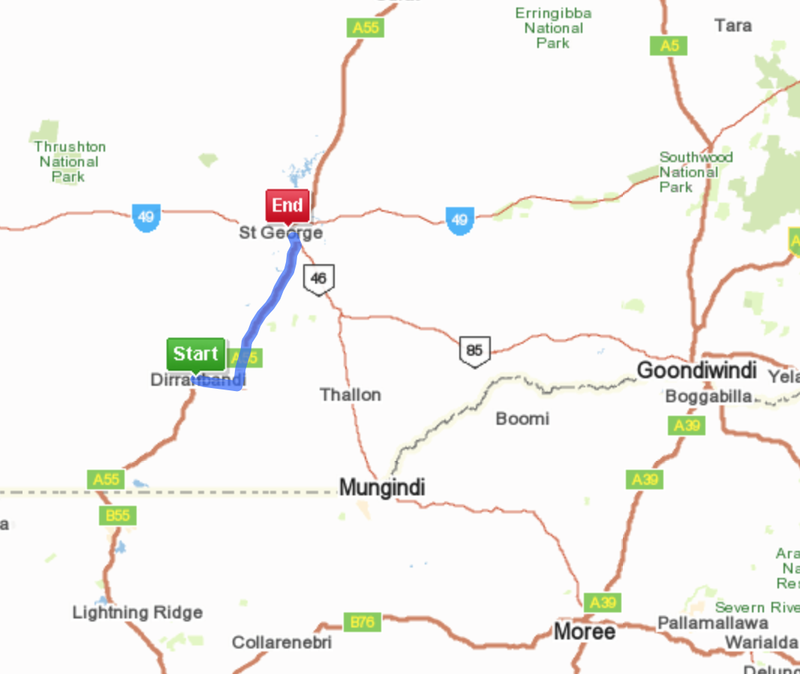 So after a drive around Dirranbandi, we headed toward St George where we were aiming to stop for a late lunch by the Balonne River. I have a friend who has never been to St George and asked if I would take photographs for him, which of course, I did. The road to St George from Dirranbandi is all sealed and is a very easy road to travel on. The road was finally completed and sealed in 1988 (coincidentally the same year cotton was first picked at Cubbie Station). The scenery was starting to look a little more desolate, though wheat fields seemed to be doing well. Emus started appearing in the paddocks and so managed the odd quick photograph of these birds. My 70-200mm lens was working overtime. Reaching St George, we stopped for a few supplies from the very friendly supermarket and headed to the banks of the Balonne for some shade and some lunch and to let Pepe have a run. Leaving St George and heading towards Begonia Station I started to feel a little more excited wondering what I would see there. I had arranged weeks before with the new owner to stop in for a coffee and then found out that we could free camp on the property for a couple of nights. Along the way, it was more and more obvious that rain was desperately needed as the cattle grew more painfully thin and barely a green blade of grass could be seen. In my next post, I will tell you some more about Dad at Begonia Station.